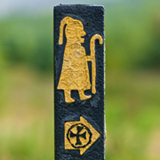 Waymarking sign comprising an image of a pilgrim with a Celtic tonsure, tunic and staff and a directional arrow in yellow inset with a cross of arcs in yellow, used in Ireland to denote a Pilgrim Path developed by the Heritage Council. The pilgrim image based on an image on a stone at pilgrimage site in County Cork. The cross of arcs is one of the main symbols of pilgimage in Ireland. Pilgrim with staff, from Art in the Christian Tradition, a project of the Vanderbilt Divinity Library, Nashville, TN. http://diglib.library.vanderbilt.edu/act-imagelink.pl?RC=54923 [retrieved April 23, 2019]. Original source: http://commons.wikimedia.org/wiki/File:Pilgrim_Path_Waymarker_(Ireland).jpg.